Telephone service for Hagerstown began with the establishment in February 1883 of a central office by the Telephone Exchange Company. It was situated above Stouffer and Darner's marble cutting shop on West Antietam Street near Court House Alley. Later that year the Telephone Exchange Company was succeeded by the Chesapeake and Potomac Telephone Company. J. H. Beachley was the first subscriber, and Miss Maggie McCarty was the first operator. As the number of subscribers grew, 24-hour service was required and a nighttime operator, Mr. Beimis Stauffer, handled the big switchboard from 5 p.m. until 8 a.m., according to Ron Reaves. In 1883 Hagerstown was connected with Frederick and in 1884 with Baltimore. In 1885 the telephone office was moved to the old Mail Building on South Jonathan (later Summit), with Frank Kennedy as the manager. In 1888 there were over 300 subscribers in Hagerstown. By 1893 Hagerstown was a progressive city, and the City Directory (also on this web site) boasted "The city possesses all conveniences of modern invention, such as electric lights, water works, telegraph and telephone service, etc." The Chesapeake & Potomac Telephone exchange employed at least 13 men whose profession was listed in the directory as "tel operator". And in the same 1893 directory, five businesses listed their telephone number - a family market, a steam bottling works, a steam laundry, a florist and a dealer in "all Kinds of Lumber, Doors, Sash, Blinds, Shutters, Mouldings, &c."
The additional exchanges in the county were added over time. Williamsport had a 25-wire switchboard in 1886, but only eight subscribers. By 1907 Clear Spring, Hancock, Keedysville, and Smithsburg had separate sections in this directory, indicating perhaps they also had exchanges by then, though the written history is unclear of the dates. 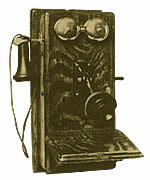 The party line system allowed phone lines to be shared by a number of subscribers. The letter after some of the Hagerstown numbers (F, K, R and W) indicates that this was a party line, shared by four subscribers. In the country, party line subscribers shared the line with many more users. The operator calling the Keedysville number Keedys 9-15 would have selected the 9 line and then rung one long and five short rings for the 15 at the end of the number. Subscribers on the Keedysville 9 line would have heard all the rings, but in theory would have picked up only when they recognized the shorts and longs of their own ring. Since no operator can correctly memorize the 1500 numbers contained in this directory, it is necessary, in order to secure quick service, that you call by number, not by name. Messenger service is arranged only for the purpose of summoning a person to a telephone. Instructions For Using The Telephone. To obtain good results, it is necessary to hold the lips close to the transmitter to speak directly into the mouth piece, in a distinct though moderate tone. Please do not allow outsiders to use your telephone. Such use may keep your line busy many times when calls are made for it. Calls that might result to your pecuniary advantage may thus be delayed or lost. Please refer outsiders to the nearest public pay station. 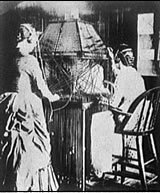 There were pay stations located throughout Hagerstown, for example in the Bellevue Asylum, Diamond Café in the Public Square, the Court House, the Gantz Hotel, Hotel Hamilton, Landis House on West Washington, North Potomac Street, the Baldwin House, the Market House, and the Railroad Y. M. C. A. Pay stations were also located at the C. & P. office in Williamsport, Mrs. Sallie Ankeney in Clear Spring, Dr J. A. West in Hancock, and Mrs. Steck in Smithsburg. Several businesses in Hagerstown had their own Private Branch Exchange System, what today would be called a PBX, among them the Hagerstown Railway, Mail Publishing Company, and Diamond Bindery. It is noted that Miss Mary Titcomb, Librarian of the Washington County Free Library, had a phone in her Summit Avenue home in 1907, but the Library itself did not. Chesapeake and Potomac Telephone Company of Maryland. The Telephone in Maryland, 1974. Martin, Oliver. Chesapeake and Potomac Country. Chesapeake and Potomac Telephone Company, 1928. Reaves, Ron. Telephone service comes to Maryland. Cracker Barrel, Dec 1988. The assistance of Don Donat, Washington County Genealogical Society and Tara Potter of Verizon Maryland is much appreciated. Library of Congress, Prints and Photographs Division, Detroit Publishing Company Collection (det 4a27894).